One wouldn’t think that a Paranormal Museum would have much involvement in a Wine and Chocolate Days festival hosted by the San Benedetto Wind and Visitors Bureau, but Maddie Kosloski believes that rotating exhibits ensures new customers and keeps her business out of the red. That is why she managed to acquire a Haunted Molinillo from Mexico, one that not only traditionally mixes hot chocolate but also rattles when lies are spoken. The latter characteristic has not yet been proven, but Maddie has enough experience with the unexplainable to at least hope it attracts curiosity. To further incorporate the museum with the Chocolate festival, Maddie plans to sell a small supply of gourmet, hand-crafted, very expensive chocolates from Reign Chocolates, but delivery seems to be delayed. That’s a stressor that her teashop neighbor Adele Nakamoto certainly doesn’t need right now, as her wedding plans are making the already detailed-obsessed, control-freak woman a bridezilla pushing the limits of her closest friends. With Adele already frazzled with menu tastings and guest lists, Maddie volunteers to pick up both their orders at the Reign Chocolate store. Nothing in Maddie’s haunted museum collection could have predicted what she would discover, namely a chocolate-coated Reign owner drowned in his exclusive product. Maddie’s own relationship with Detective Jason Slate is still going very well, but a speed bump looks in store for them when she decides to accept what seems to be her destiny to solve murders. As it is, Detective Laurel Hammer continues to be her lifelong nemesis and thorn in her side; it’s a rivalry not helped by Maddie’s Ghost Detecting cat’s propensity for attacking the abrasive officer. The deceased co-owner and marketer of organic, pure chocolate confections is revealed to have been intertwined in a web of romances, and not even a bomb threat or attempted drowning will prevent Maddie from doing all she can to lift the dark veil that looming over San Benedetto. The once-reluctant owner of a haunted museum fully embraces her town and her quirky business, and that affection is what motivates her to find justice for the victims. Maddie does her best to stay out of the way of the official investigation while keeping the detectives informed, but the combative Laurel Hammer never makes that easy. A fascinating detour into the history of the Haunted Molinillo adds additional layers to the novel, and it’s a plot skillfully balanced by the very grounded interactions between Maddie and her conservative, very protective mother. What with Adele’s bride-brain demanding everyone’s complete attention, Maddie barely has time to deal with whatever weirdness is going on with her neighboring ex-boyfriend. The banter between Maddie’s friends, a compelling glimpse into the world of chocolate production, and Maddie’s belief that social media is the devil’s cocaine, ensure that this continues to be a unique and exuberantly fun mystery series. 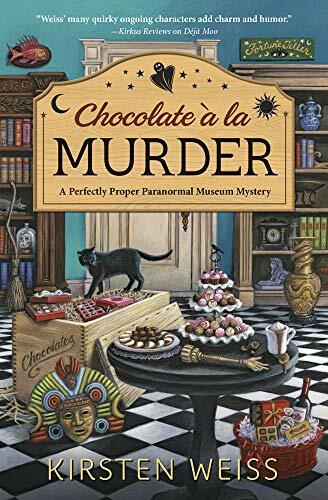 To enter to win a copy of Chocolate a la Murder, simply email KRL at krlcontests@gmail[dot]com by replacing the [dot] with a period, and with the subject line "chocalate,” or comment on this article. A winner will be chosen April 6, 2019. U.S. residents only. If entering via comment please include your email address. If entering via email please include your mailing address in case you win, we will not use your address for any other reason. You can read our privacy statement here if you like. Check out other mystery articles, reviews, book giveaways & mystery short stories in our mystery section in Kings River Life and in our mystery category here on KRL News & Reviews. And join our mystery Facebook group to keep up with everything mystery we post, and have a chance at some extra giveaways. And check out our new mystery podcast featuring mystery short stories and first chapters read by actors! A new episode goes up next week! This is a fun series. Looking forward to reading Maddie's next adventure. Sounds like a fascinating book and series. Adding to my TBR list.